The low profile liquid CPU cooler has emerged as a powerful and handy accessory to PC users. If you’re unsure whether this device is useful for you, read further as we discuss what a low profile liquid CPU cooler is and how it can help boost the performance of your computer. 1 What Happens Inside Your PC? 3 What is a Low Profile Liquid CPU Cooler? What Happens Inside Your PC? In most computers, you hear a faint sound coming from a small fan inside your CPU. The sound is likely to get louder when you use the computer for gaming or process-intensive applications. This causes a natural increase of the temperature inside the computer. When your processor is overworked, it tends to overheat. This affects performance, and may cause your computer to ultimately give up. Although a fan may be useful to decrease the temperature within the processor, the cooling effect may not be enough. For gaming enthusiasts with high-end hardware wherein the processing may be 10 times faster, a low profile liquid CPU cooler should be your option. A liquid CPU cooler is the best alternative for your old cooling fan. 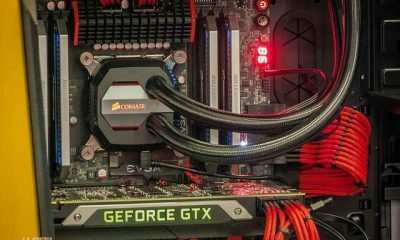 The liquid cooling system provides a huge advantage to high-performance computers that need to deliver speed, power, and graphics. This liquid cooling solution involves a radiator for the processor inside of your computer. Just like the radiator of your car, the liquid cooling system circulates a liquid through a heat sink that is attached to the processor. When the liquid passes through the heat sink, the heat is transferred from the hot processor to the cool liquid. As a result, the hot liquid moves out to a compartment behind the case and transfers the heat to the air outside of the case. The cooled liquid travels back through the system to the different components and then starts the cycle again. What is a Low Profile Liquid CPU Cooler? A low profile liquid CPU cooler is a special kind of product built for smaller CPU cases, hence its name. It is designed to fit into a small factor case commonly seen in home PCs. If your CPU is using a Micro-ATX, a Mini-ITX, or a smaller motherboard form factor, you need to buy a low profile liquid CPU cooler instead of the conventional product for standard CPU towers. Without a low profile liquid CPU cooler, your computer may overheat while playing an intense computer game! An air cooling system may have its limitations. Therefore, to ensure that your high-performance desktop will always perform at its best, using a liquid CPU cooler is the best choice. Standard liquid CPU tower coolers will never fit properly into small form factor PCs. This is where the low profile liquid CPU cooler brings home the bacon — it is custom-fit for installation in slim and compact CPU cases. The low profile liquid CPU cooler makes use of fans. However, in a conventional air-cooling system, the sound of the fan increases as your game speeds up. As a result, the sound may be distracting. The liquid CPU cooler uses fewer fans, and so you won’t get distracted by its noise as it is kept at bay. The different components of your computer heat up when you continue to use it. However, with the liquid cooling system, the heat is insulated inside the coolant. This means that the heat is not transferred to the different components of the computer, but the heat is insulated in the tube and then released outside of your computer. This way, the heat is not trapped inside the unit, which may otherwise cause overheating and damage the whole computer. It is also able to sustain cool temperatures over time. The fan cools the components by blowing away the heat out of the system and does not trap the heat to achieve maximum performance of the CPU. If you live in a warm climate, using a liquid cooling system is perfect. When the ambient air is warm, it tends to heat up the CPU faster. The maintenance of the internal temperature allows your PC components to last longer than usual. This is because the risk of wear and tear caused by overheating will be reduced. Some people think that a low profile liquid CPU cooler may only be used on a gaming computer. However, it also performs brilliantly in just about any kind of computer, but more so on PCs that are used for long hours. To ensure that you get a seamless PC experience and save you thousands of dollars, always choose a superior quality product. Make sure that the low profile liquid CPU cooler fits perfectly not only into your computer but also within your budget.